Inspired by Keith over on our classics site with his 'A Grand Monday' feature, we've decided in a definitely-not-ripped-off fashion to do something completely different. Welcome to Five Grand Friday. Each week we'll be finding a little motoring gem for less than £5k and sharing it with you. 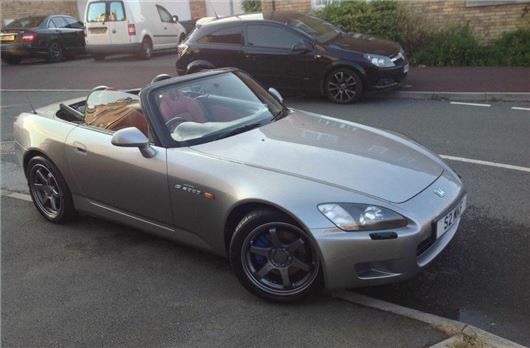 So to kick it off we've found this lovely Honda S2000 in the classifieds. It's (supposedly) summer and everyone keeps banging on about open-top motoring so we're unashamedly jumping on that bandwagon. At just £4995 we're very tempted by this early S2000. Having covered just over 110,000 miles - below average for a 16 year-old car - it has a full service history. The S2000 is a fairly bullet proof model, but many have been driven hard and so the key is finding a well looked after one. Finished in a dark silver with grey wheels and a black hood, this example has the contrasting red leather interior. There are a few marks on the paintwork, mainly the door edges and a scuff on a wheel arch. The driver's seat is worn in the usual place, but aside from that it looks very tidy for its age. The S2000 - imaginatively named because of its 2000cc capacity engine - came from a time when Japanese brands produced some great sports cars. Launched in 1999, it arrived at the same time as, what sadly turned out to be, the last the Toyota MR2 and the Celica. Along with the likes of the Nissan 300ZX, Mitsubishi 3000GT and Mazda RX-7, Japanese sports coupes ruled the roost in the late 1990s. So it was no surprise that the Honda S2000 proved instantly popular when it was first launched in the UK. Here was a good-looking roadster with Japanese engineering and reliability. But the real highlight was the way it drove. Don't expect decent economy, especially if you decide to exploit the wonderful engine. And the half-electric roof is a bit awkward as you have to release two catches. The interior is definitely 'of its time' with a distinctly 90s feel, but it's also very simple with everything you need close at hand thanks to the clever dashboard design. But once you're out on a quiet bit of road, you can forgive all that as the S2000 is simpy great fun to drive. Yes it's a noisy (long motorway journeys are not fun) and there was no stability control fitted until 2006, so you do have to be wary in the wet, but it's a proper fiesty little sports car that's very involving and engaging. We think the S2000 is destined to be a future classic. Get a good one, look after it and it's sure to only go up in value.